:: KwikGoal Official Futsal Soccer Goal 6' 7"x9'10"
KwikGoal Official Futsal Soccer Goal 6' 7"x9'10"
Our KwikGoal Official Futsal Soccer Goal 6'7"x9'10", is 3.15" W x 3.15" D aluminum front post and crossbar, with a finish of powder coated white. Great goal for futsal, strong goal, built for hard shoots. KwikGoal Lifetime Guarantee. 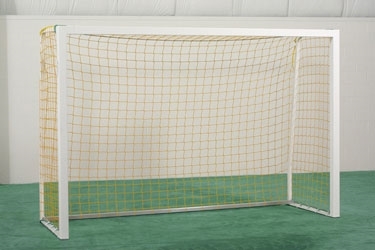 Quality Features: * Back bottom bar * Kwik Lock® Net System * Powder-coated white finish, KwikGoal Lifetime Guarantee. SizeHeight: 6'7" Width: 9'10" Depth: 2'8" Base: 3'7.5"